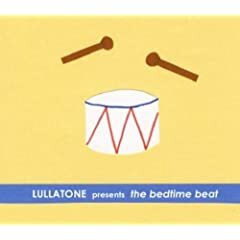 It’s been a wee while since I’ve heard an album that I though I just had to write about instantly but from the wonderful opening track it was clear that Lullatones "The Bedtime Beat" was going to be one of those. Simple, cute and creative beyond belief, like the child who is given a cardboard box rather than a remote control car or whatever the kids are playing with these days, that cardboard box will become to the child whatever he so pleases and so to Lullatone each and everything in their sight is transformed Rugrats style into something else. An unrivalled ability to see the most unlikely things in the most mundane objects and sounds. The bathwater becomes a drum pattern, as do secretly taped snores, there are no boundaries, all objects are instruments in their eyes. So here we have a minor masterpiece, this is the sound of Deerhoof had electricity never been invented, Mice Parade if they had had all their batteries stolen. Cute, clever and certainly more than worth of your attention.